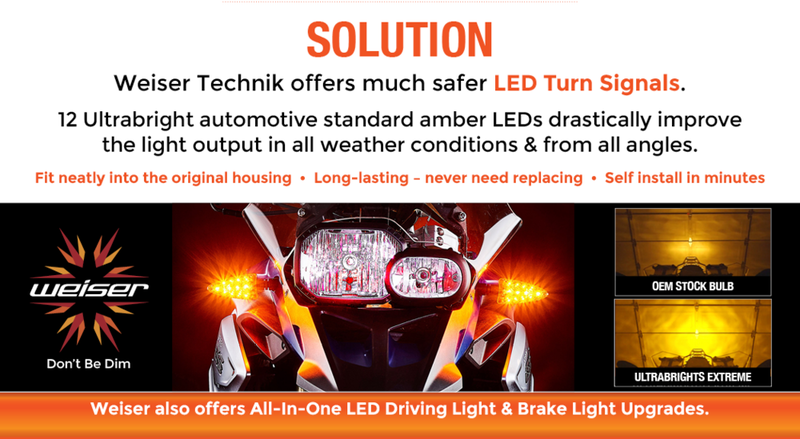 Bringing the safety & conspicuity of LED lighting to classic and new BMW motorcycles from the 1970s to the present. Weiser LED upgrades fit inside the OEM turn signal housings. The brightest turn signal on the market today for earlier BMW models from 1993 to 2004. I ENCOUNTER MORE AND MORE DISTRACTED drivers every day, which continually fuels my search for greater conspicuity. Three years ago, I purchased the first-generation Weiser UltraBRIGHT LED turn signal inserts for my 2014 BMW R 1200 GS. I found installation to be a simple plug and play with no CANBUS problems while providing significantly enhanced visibility of my turn signals. 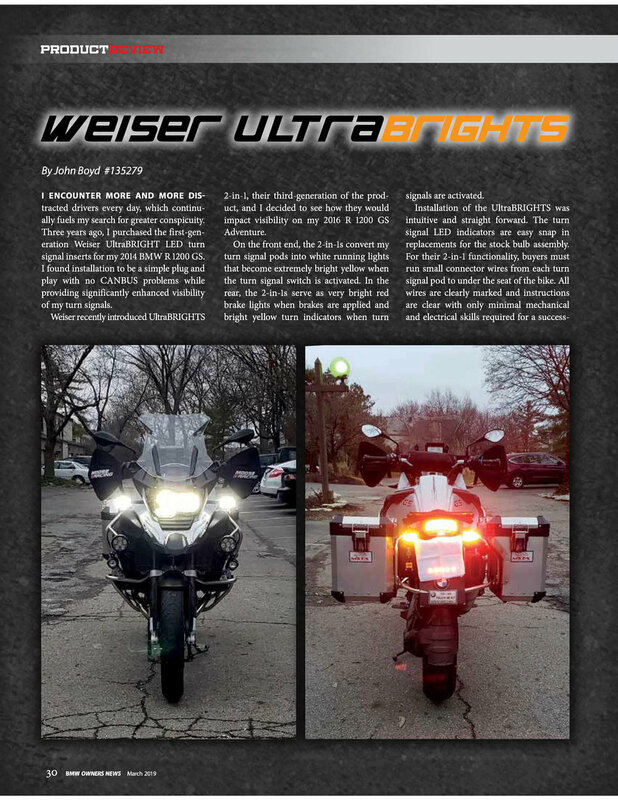 Weiser recently introduced UltraBRIGHTS 2-in-l, their third-generation of the product, and I decided to see how they would impact visibility on my 2016 R 1200 GSAdventure. On the front end, the 2-in-ls convert my turn signal pods into white running lights that become extremely bright yellow when the turn signal switch is activated. In the rear, the 2-in-ls serve as very bright red brake lights when brakes are applied and bright yellow turn indicators when turn signals are activated. Installation of the UltraBRIGHTS was intuitive and straight forward. The turn signal LED indicators are easy snap in replacements for the stock bulb assembly. For their 2-in-l functionality, buyers must run small connector wires from each turn signal pod to under the seat of the bike. All wires are clearly marked and instructions are clear with only minimal mechanical and electrical skills required for a successful installation. Weiser provides a bypass module for BMW's CAN-bus system. Again, all wires are clearly marked, and the only chal­lenge is being sure you locate the appro­priate turn signal/brake wires in the BMW wiring harness in order to enable the CAN-bus bypass. As I mentioned, I found the installa­tion of the Weiser UltraBRIGHTs to be easy and once installed, the running/ brake/turn signal LEDs are extremely bright. During a recent ride where I was run­ning sweep, the leader of the group said it was always easy to spot me. Friends approaching me from the front said the running lights made my bike stand out while comments regarding my auxiliary brake lights said they are very attention-getting. While stopped at red traffic signals, it appears that vehicles behind me are giv­ing me more space, as I have been gain­ing about a car length of space between me and car behind me. My turn signals are more visible with the running light and brake light on the active turn signal side completely extinguished during turn. An added bonus is your motorcycle retains its stock appearance with no addi­tional lights or wires hanging off. Overall, I believe the UltraBRIGHTS significantly increase turn signal visibil­ity over stock. The UltraBRIGHTS 2-in-l also increase turn signal visibility while really stepping up conspicuity going and coming. Weiser UltraBRIGHTS LED 2-in-l Driving Light/Turn Signal and Utra­Brights 2-in-l Brake Light/Amber Turn Signal upgrades for BMWs each carry an MSRP of $249. For additional informa­tion, visit weisertechnik.com.